How many RVs will you own over your lifetime? According to one industry source, an average RVer will buy 3.5 RVs during his or her life. This means you can expect to spend at least tens, and probably hundreds, of thousands of dollars on RVs over your lifetime. That’s why it’s well worth your time to educate yourself about what really happens when you step onto a dealer’s lot. Here’s what the dealer would like you to think is happening. You walk around and shop for the RVs that will best suit your needs. The salespeople will make themselves available to answer any questions, to help you buy the best possible RV, but otherwise they’ll stay out of your way. Then, when it comes time to buy, you’ll be treated respectfully and honestly. After a little negotiating, you’ll get a price that’s fair for both you and the dealer. Everybody wins. RV salesmen see people just like you every single day. On the other hand, you might buy an RV once per decade. So who do you think will have the advantage in the deal? You’ll be a pawn in a game that you don’t even know is being played. Here’s what happens when you walk onto a big dealer’s lot. As you stand there looking at the beautiful coaches, wondering where to start, a pleasant-looking salesperson walks up. Are you young? "Hmm, they’ll probably want an entry-level RV, but I’ll try and sell them an expensive one first and see what happens. I’ll tell them they’ll need a big one to accomodate their growing family." Are you retired? "Great, a big Class A should be an easy sell." Are you a married couple? "I need to listen and figure out who wears the pants, so I’ll know who to work over the hardest." What kind of vehicle did you drive up in? "Woohoo, look at that brand-new BMW. These folks have money, and should be pushovers. There’s a big commission in my future!" the salesman is already planning how to work you. You’ll climb into a few RVs and get excited about the idea of owning one. You’ll think that you’re in control of the buying process. “We have a 2009 Comfy Coach.” Hmm, he thinks – an older model. They’re probably attached to it after all these years. I’ll need to compliment them on what a great choice they made, before I try and convince them it’s worth a lot less as a trade-in than they thought. “We have a 2015 Comfy Coach.” Hmmm – a newer model. If they were happy with it, they wouldn’t be here so soon after buying it. I’ll tell them it’s much too small for them – I bet I can easily sell them into a much bigger unit. Also, they’ve been hit hard with depreciation, and haven’t had a lot of time to pay down the loan. That means they’re probably underwater on the loan (owing more than the coach is worth). So I’ll have to jack up the price on the new coach in order to make enough to pay off the loan on their older one. In fact, I think I’ll jack the price way up on the new one – high enough for me to make a big commission even after I let them haggle me down a bit. I’ll even act sheepish after the negotiation, so they’ll think they got a great deal. “We don’t have an RV right now.” Hmm – they’ve probably never bought an RV before, so they should be easy marks. Woohoo, I’m going to get a great commission on this deal! Qualify: He wants to find out what kind of trade-in you have, how experienced you are, and how much money you have. He’ll especially try to learn how big of a loan you can possibly qualify for. Present: He’ll steer you into the biggest RV possible – the one that just barely fits into the upper limits of what you can afford. Hint: his definition of what you can “afford” is much higher than yours. Close: He’ll apply pressure, with “special deals” that “my manager didn’t want to approve” in order to get you to buy the RV that he wants to sell you. •	Which size and type of RV you were actually interested in? •	How much your trade-in is actually worth? •	How much you wanted to spend? •	How much you can actually afford to spend? Nope. None of that matters. It’s all about what the salesman wants to sell you. Of course, that will be the RV that makes the most profit for him. Nothing more, nothing less. 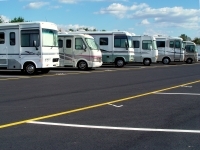 The RV Sales Process: How do You Avoid Being a Victim? RV dealers and salespeople are masters of the above process. So how do you avoid being worked over, while still buying the RV you want at the best price possible? I recently interviewed a former RV dealer, who spilled the beans on the whole buying process. He not only explained what happens during the sale, he told me step-by-step how to bypass the whole process and get the RV you want at a great price – close to, or in a few situations even below, dealer cost. We were on the phone for over three hours. Best of all, I recorded the entire thing. Click here if you’d like to listen to our conversation.